As you all know, Fort McMurray/Wood Buffalo, Alberta had a really devastating forest fire last year that wiped out several hundreds of homes, leaving a lot of people homeless. It was almost like as if the disaster wasn't real but from a movie.. but unfortunately it was 100% real. Thankfully the city is rebuilding and going to be better than ever. Fort McMurray's Wood Buffalo Brewing started brewing again not long after people were allowed to return to the city. I've never had anything from Wood Buffalo Brewing because Manitoba doesn't get any beer from Alberta outside of Big Rock and Brewsters, so we're missing out a lot. Thanks Kailey for bringing this beer back from all the way up in Ft McMurray! Northern Special IPA is an IPA that tops out at 6.0% ABV and 54 IBU, so it's not that high up on the bitterness - but there's nothing wrong with that! The beer is described as following in the footsteps of its west coast counterparts and blazes a new trail into this northern region. Expect a kick in the mouth with this big floral Ale but don't let it discourage you. 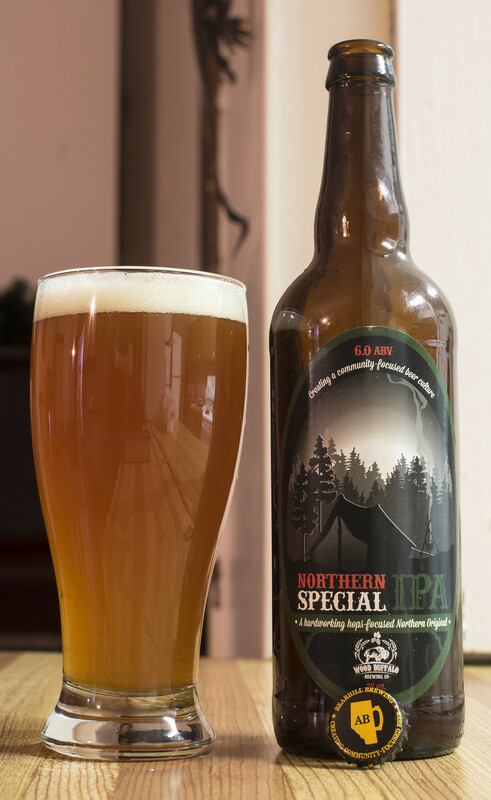 Appearance: Northern Special pours a lightly cloudy, caramel ale with a decent off white/almost beige head to it. Minimal amount of carbonation but looks solid so far. Aroma: This IPA isn't kicking me in the nose so far - I'm getting notes of malt: A caramel sweetness with a hint of soapiness at the end, a bit of a grapefruit aroma that is more common in West Coast IPAs. A hint of bubble gum, slightly floral and grassy hops and a hint of pine at the very end. Not really that bitter so far. Taste: Like the aroma, I'm finding that this is more of a caramel-forward IPA more than hop forward. It's decently sweet and very easy to drink with flavours of caramel, a bit of grassiness from the hops, a hint of grapefruit (not as prevalent as it was in the aroma), a light herbal flavour to it and a hint of pine bitterness lingering in there once in a while. Very easy to drink but nowhere near as bitter as most IPAs I drink. Lastly, there's a bit of a piney aftertaste that tickles the tongue long after the beer is finished. Overall Thoughts: Reminds me more of an Amber Ale more than an IPA. It's decently sweet and caramelly but misses out on the harsh/bitter West Coast bite that everyone knows. Really solid beer but as an IPA? Not really but I'd certainly drink this again easily! Of course it's substantially better than Keith's though.. but that's easy to do! The Drunk French Canadian praises Dieu du Ciel!